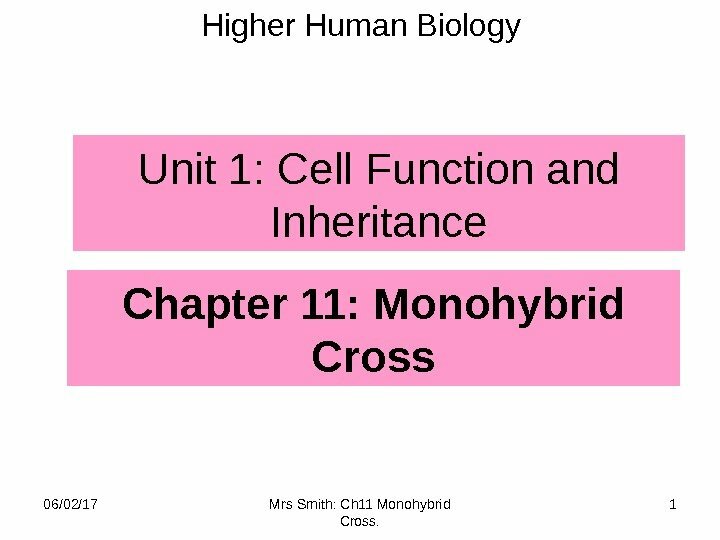 Chapter 11: Monohybrid Cross. 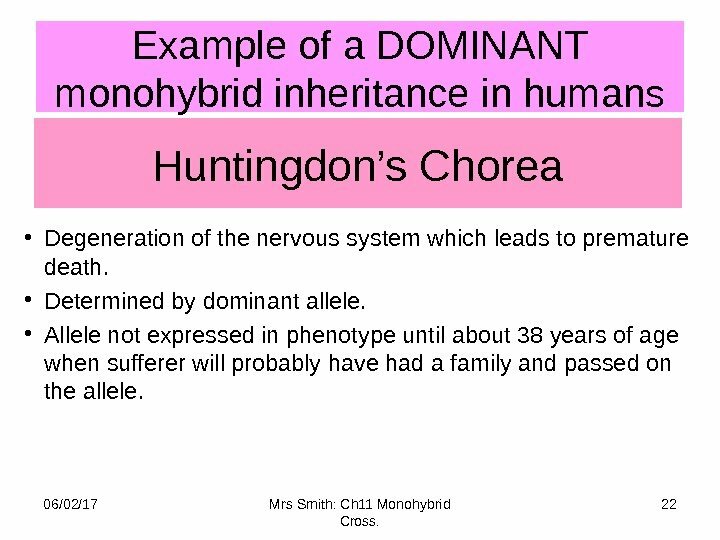 Higher Human Biology Unit 1: Cell Function and Inheritance 06/02/17 1 Mrs Smith: Ch 11 Monohybrid Cross. 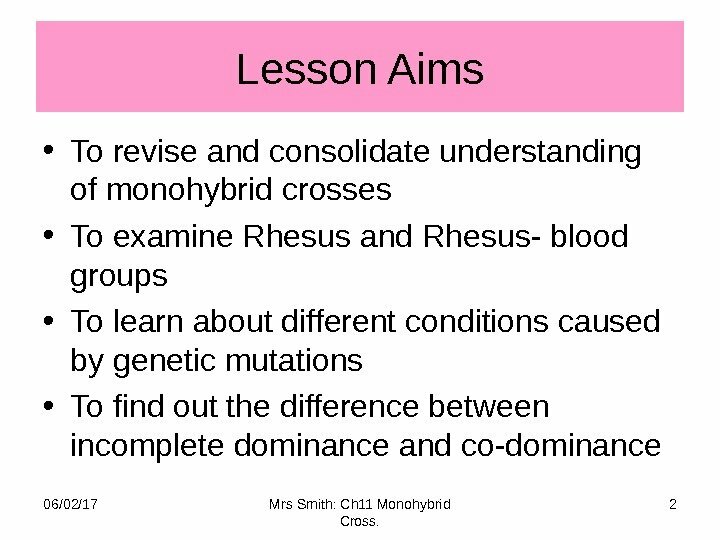 Lesson Aims • To revise and consolidate understanding of monohybrid crosses • To examine Rhesus and Rhesus- blood groups • To learn about different conditions caused by genetic mutations • To find out the difference between incomplete dominance and co-dominance 06/02/17 2 Mrs Smith: Ch 11 Monohybrid Cross. 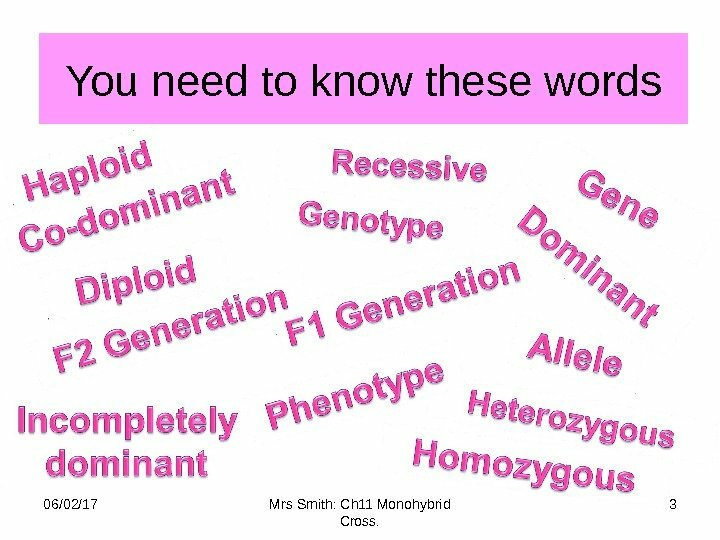 You need to know these words 06/02/17 Mrs Smith: Ch 11 Monohybrid Cross. 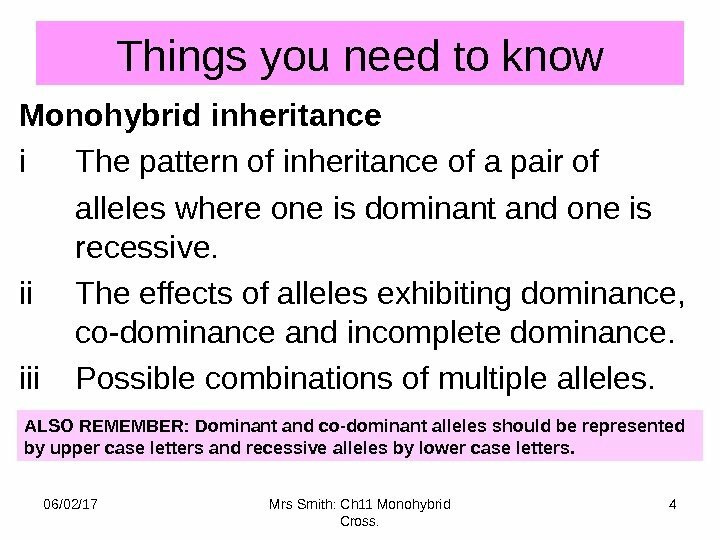 Things you need to know Monohybrid inheritance i The pattern of inheritance of a pair of alleles where one is dominant and one is recessive. ii The effects of alleles exhibiting dominance, co-dominance and incomplete dominance. iii Possible combinations of multiple alleles. 06/02/17 Mrs Smith: Ch 11 Monohybrid Cross. 4 ALSO REMEMBER: Dominant and co-dominant alleles should be represented by upper case letters and recessive alleles by lower case letters. 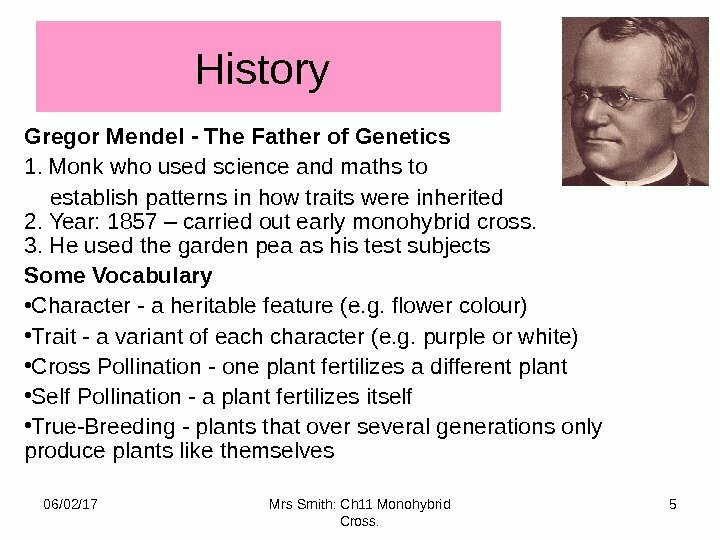 History Gregor Mendel — The Father of Genetics 1. Monk who used science and maths to establish patterns in how traits were inherited 2. Year: 1857 – carried out early monohybrid cross. 3. He used the garden pea as his test subjects Some Vocabulary • Character — a heritable feature (e. g. flower colour) • Trait — a variant of each character (e. g. purple or white) • Cross Pollination — one plant fertilizes a different plant • Self Pollination — a plant fertilizes itself • True-Breeding — plants that over several generations only produce plants like themselves 06/02/17 5 Mrs Smith: Ch 11 Monohybrid Cross. Monohybrid cross. • A cross between two parents who possess different forms of a gene referred to as a MONOHYBRID INHERITANCE. 06/02/17 Mrs Smith: Ch 11 Monohybrid Cross. 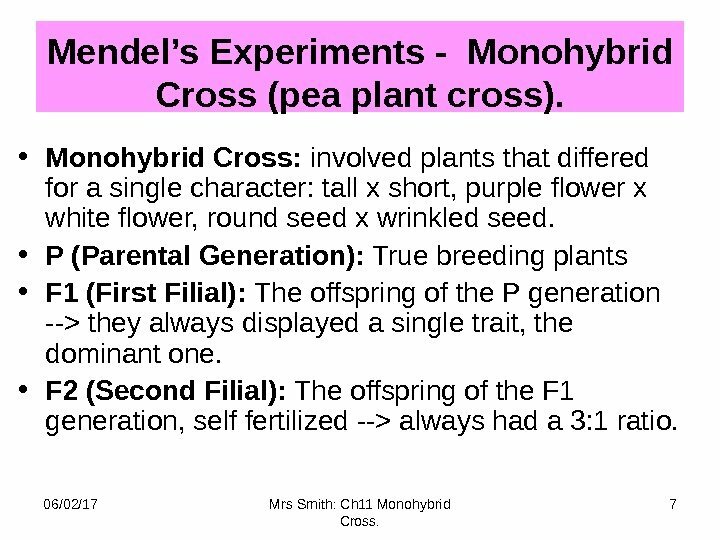 Mendel’s Experiments — Monohybrid Cross (pea plant cross). • Monohybrid Cross: involved plants that differed for a single character: tall x short, purple flower x white flower, round seed x wrinkled seed. • P (Parental Generation): True breeding plants • F 1 (First Filial): The offspring of the P generation —> they always displayed a single trait, the dominant one. • F 2 (Second Filial): The offspring of the F 1 generation, self fertilized —> always had a 3: 1 ratio. 06/02/17 7 Mrs Smith: Ch 11 Monohybrid Cross. 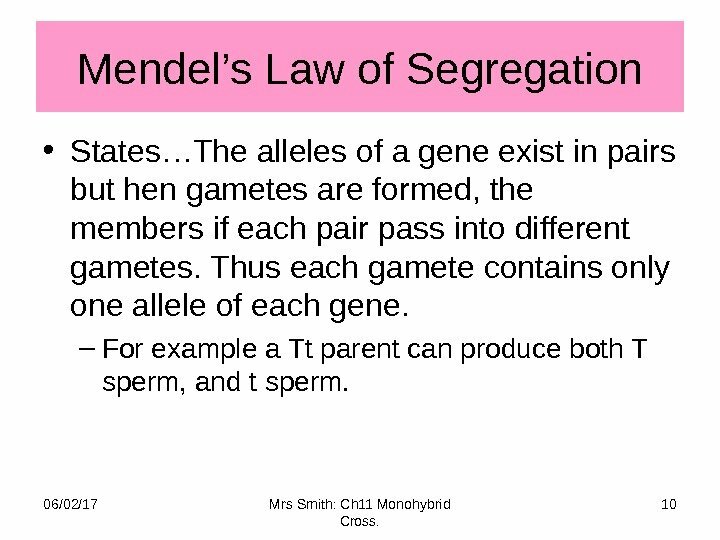 Mendel’s Law of Segregation • States…The alleles of a gene exist in pairs but hen gametes are formed, the members if each pair pass into different gametes. Thus each gamete contains only one allele of each gene. – For example a Tt parent can produce both T sperm, and t sperm. 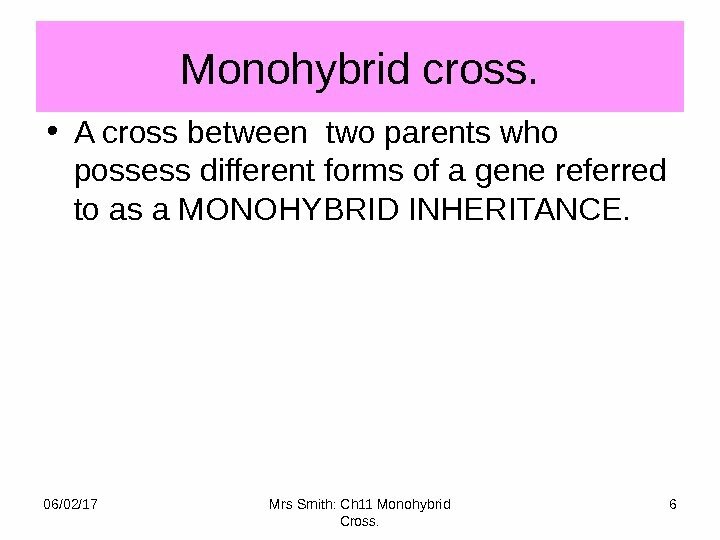 06/02/17 10 Mrs Smith: Ch 11 Monohybrid Cross. 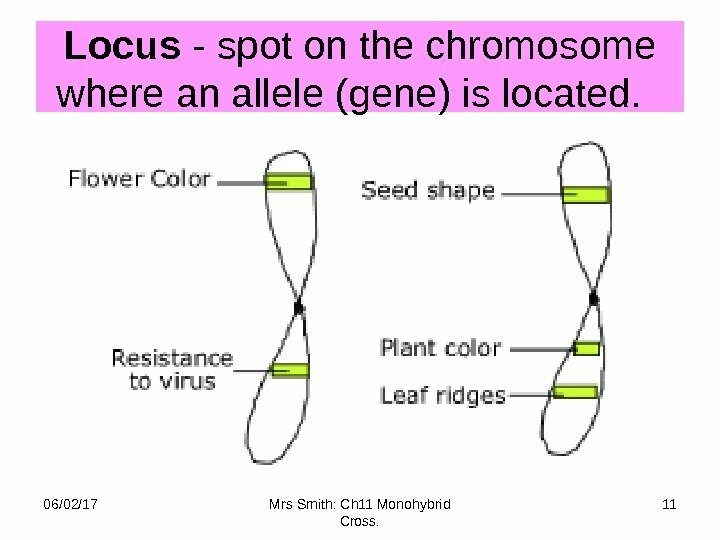 Locus — spot on the chromosome where an allele (gene) is located. 06/02/17 11 Mrs Smith: Ch 11 Monohybrid Cross. 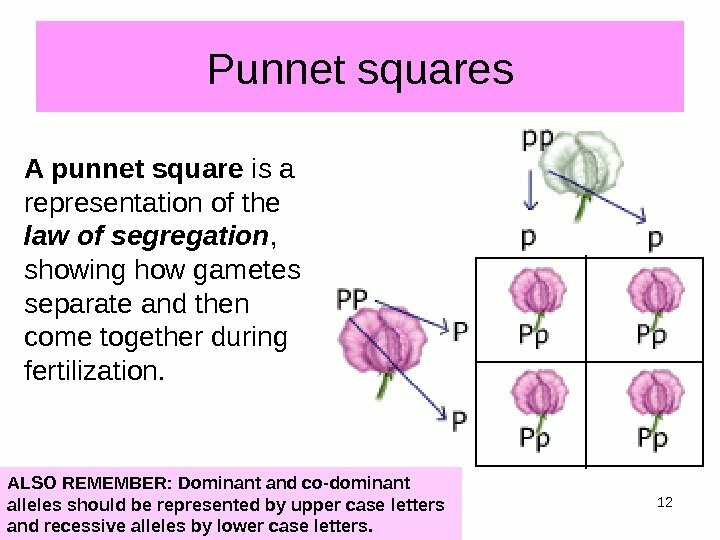 Punnet squares A punnet square is a representation of the law of segregation , showing how gametes separate and then come together during fertilization. 06/02/17 Mrs Smith: Ch 11 Monohybrid Cross. 12 ALSO REMEMBER: Dominant and co-dominant alleles should be represented by upper case letters and recessive alleles by lower case letters. Homozygous and Heterozygous • When an individual possesses two similar alleles of a gene (e. g. R and R or r and r), its genotype is said to be HOMOZYGOUS (true-breeding) and all of it’s gametes are identical with respect to that characteristic. • When an individual possesses two different alleles of a gene (e. g. R and r), its genotype is said to be HETEROZYGOUS. It produces two different types of gamete with respect to that characteristic. 06/02/17 Mrs Smith: Ch 11 Monohybrid Cross. 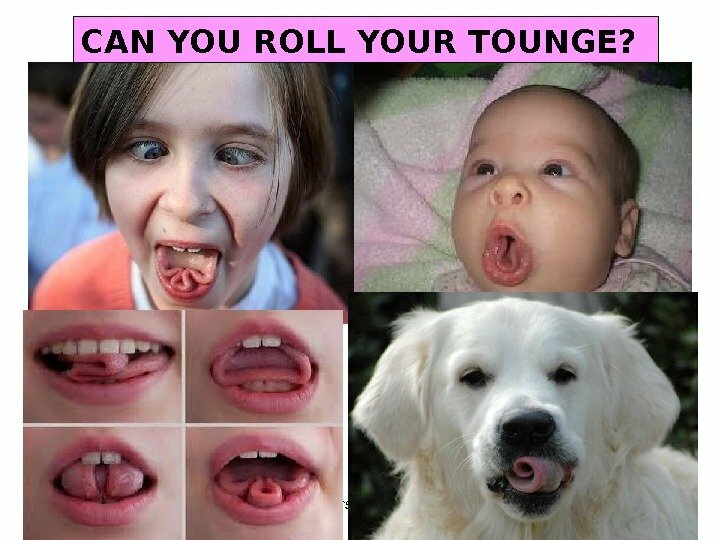 06/02/17 Mrs Smith 15 CAN YOU ROLL YOUR TOUNGE? 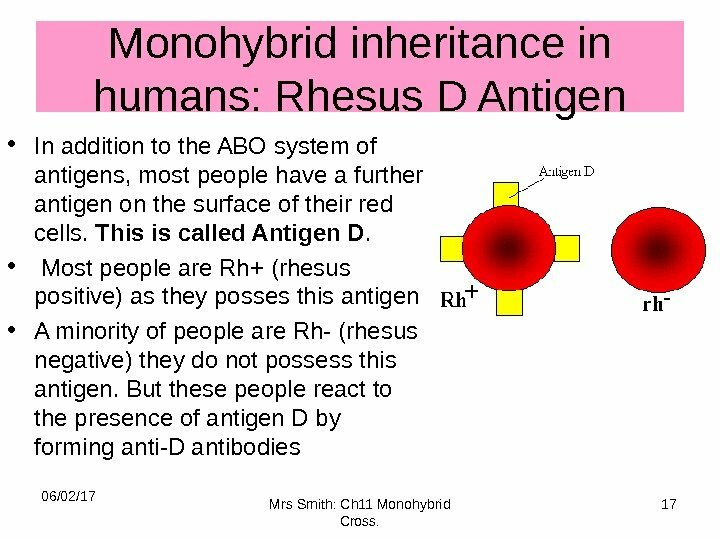 Monohybrid inheritance in humans: Rhesus D Antigen • In addition to the ABO system of antigens, most people have a further antigen on the surface of their red cells. 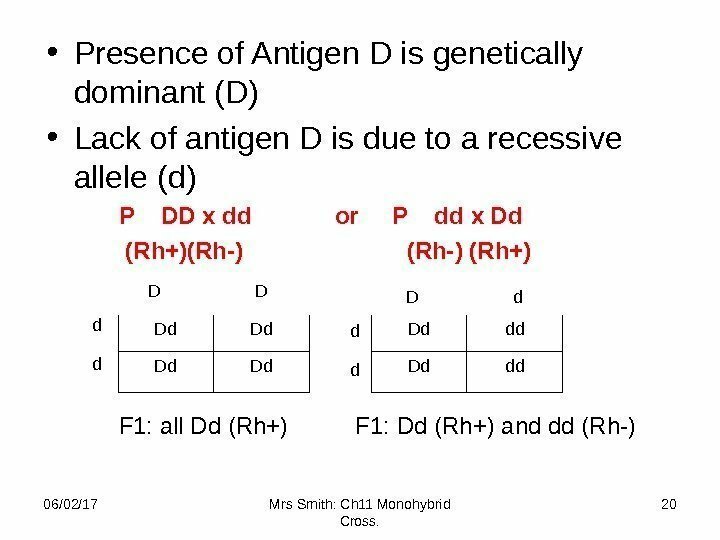 This is called Antigen D. • Most people are Rh+ (rhesus positive) as they posses this antigen • A minority of people are Rh- (rhesus negative) they do not possess this antigen. But these people react to the presence of antigen D by forming anti-D antibodies 06/02/17 17 Mrs Smith: Ch 11 Monohybrid Cross. 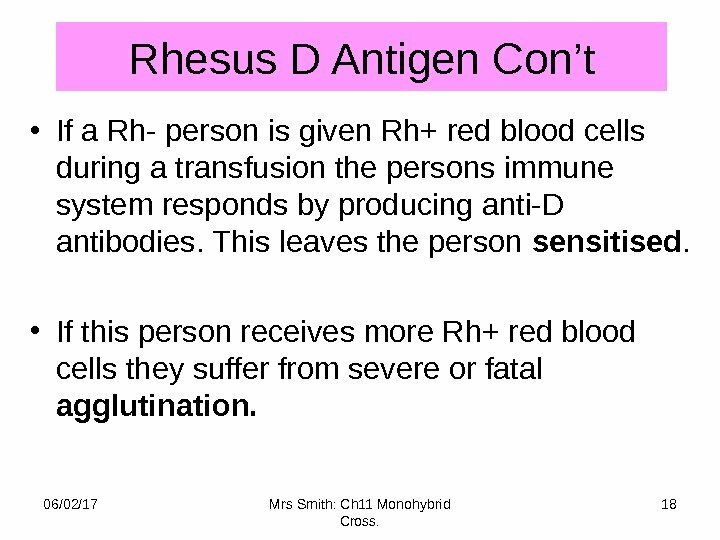 Rhesus D Antigen Con’t • If a Rh- person is given Rh+ red blood cells during a transfusion the persons immune system responds by producing anti-D antibodies. This leaves the person sensitised. • If this person receives more Rh+ red blood cells they suffer from severe or fatal agglutination. 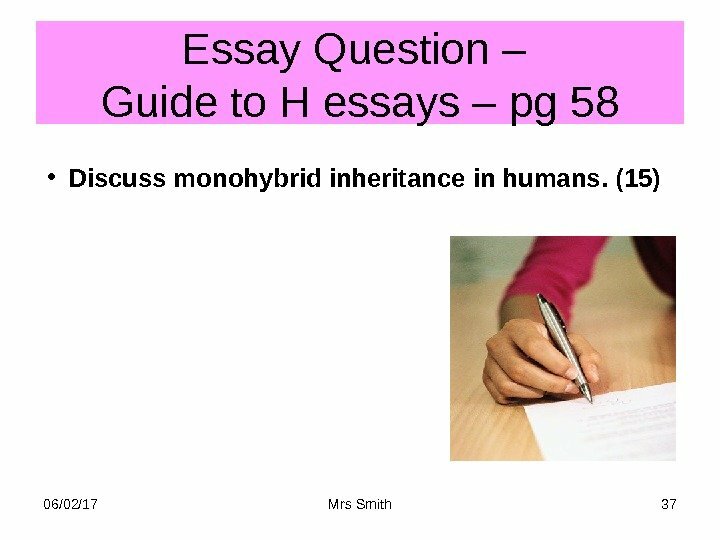 06/02/17 18 Mrs Smith: Ch 11 Monohybrid Cross. 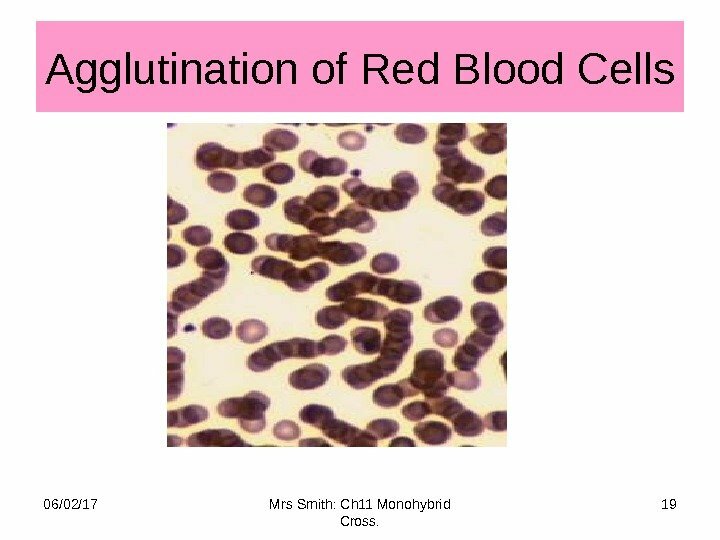 Agglutination of Red Blood Cells 06/02/17 19 Mrs Smith: Ch 11 Monohybrid Cross. 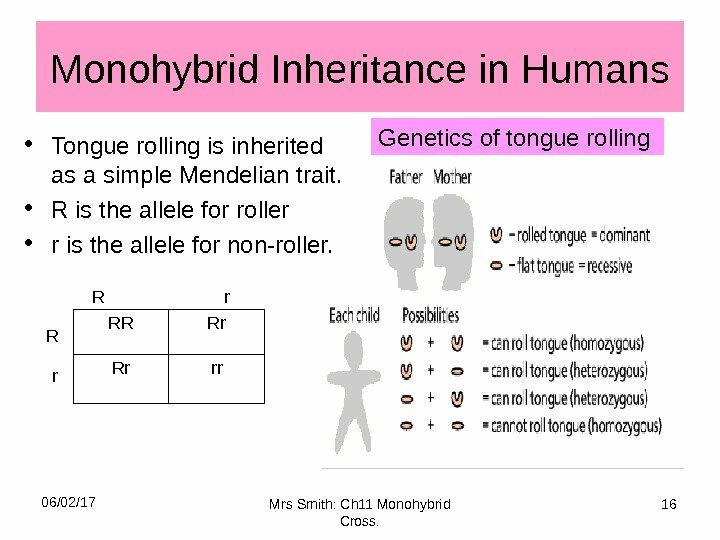 Examples RECESSIVE monohybrid inheritance in humans • Albinism — inability of the body to make melanin — inherited as simple Mendelian recessive trait. 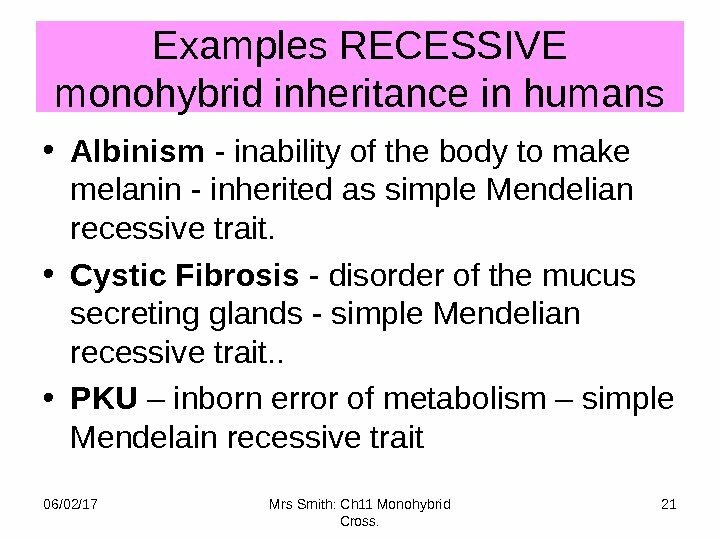 • Cystic Fibrosis — disorder of the mucus secreting glands — simple Mendelian recessive trait. . • PKU – inborn error of metabolism – simple Mendelain recessive trait 06/02/17 21 Mrs Smith: Ch 11 Monohybrid Cross. 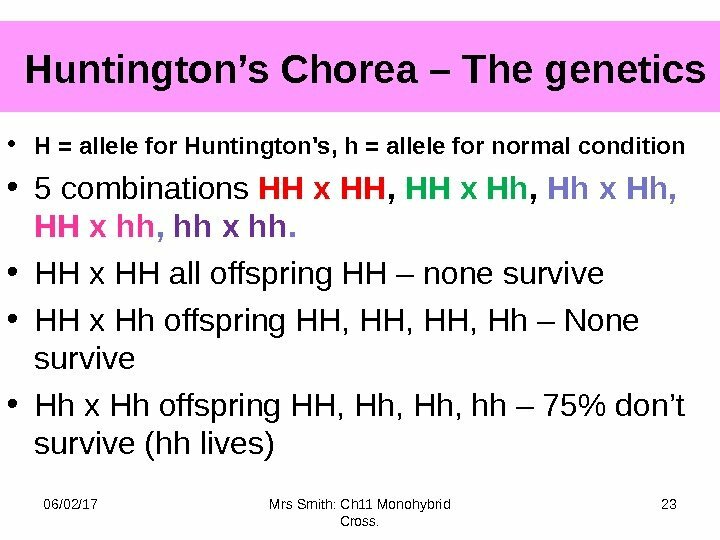 Huntington’s Chorea – The genetics • H = allele for Huntington’s, h = allele for normal condition • 5 combinations HH x HH , HH x Hh , Hh x Hh, HH x hh , hh x hh. • HH x HH all offspring HH – none survive • HH x Hh offspring HH, HH, Hh – None survive • Hh x Hh offspring HH, Hh, hh – 75% don’t survive (hh lives) 06/02/17 Mrs Smith: Ch 11 Monohybrid Cross. 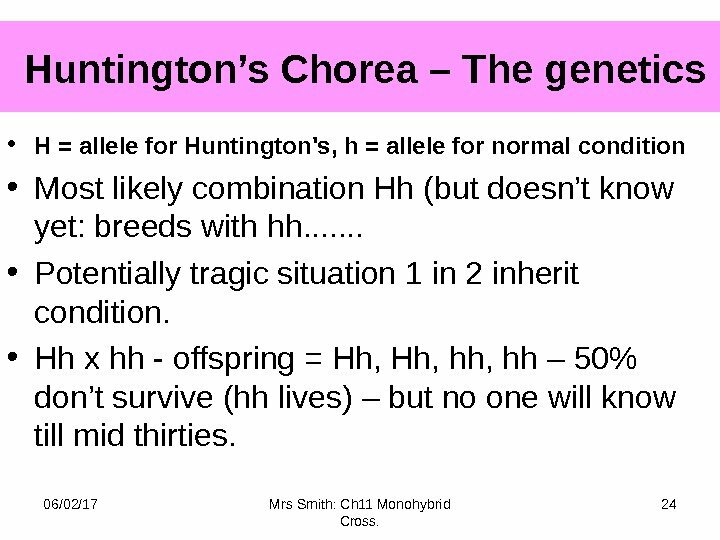 Huntington’s Chorea – The genetics • H = allele for Huntington’s, h = allele for normal condition • Most likely combination Hh (but doesn’t know yet: breeds with hh. . . . • Potentially tragic situation 1 in 2 inherit condition. • Hh x hh — offspring = Hh, hh, hh – 50% don’t survive (hh lives) – but no one will know till mid thirties. 06/02/17 Mrs Smith: Ch 11 Monohybrid Cross. Incomplete Dominance • Sometimes one allele is not completely dominant over the other, • Occurs when the recessive allele has some effect on the heterozygote. 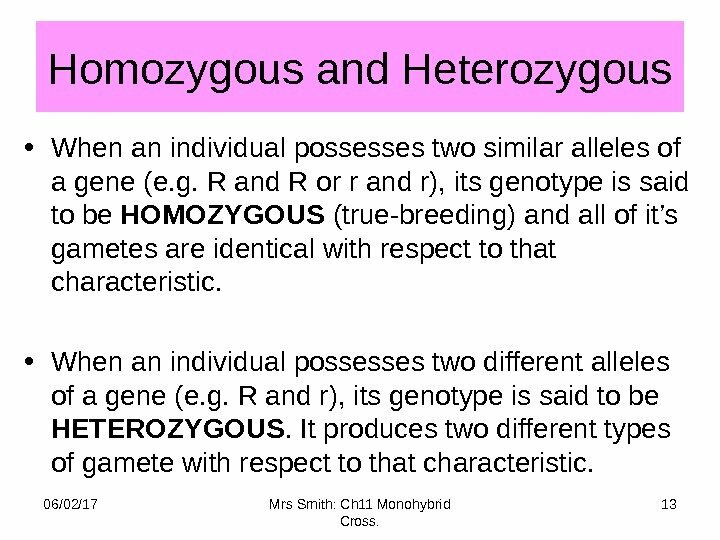 • Here the heterozygote exhibits a phenotype which is different from both of the hetrozygotes. 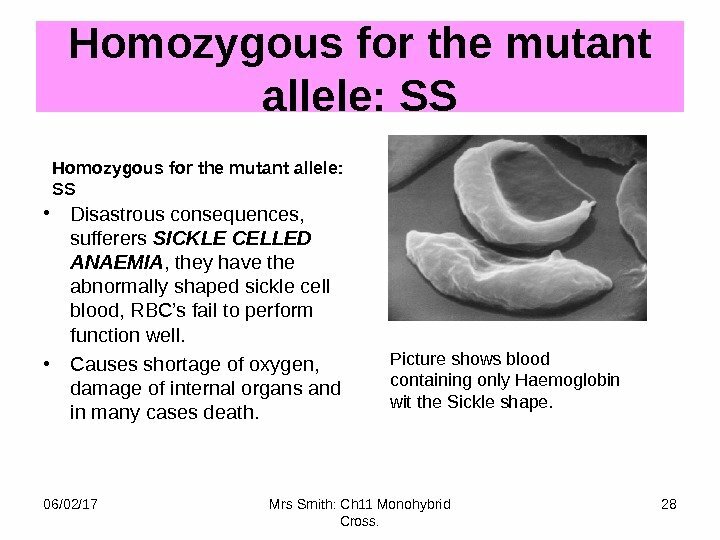 – e. g. • Sickle Cell Anaemia • Resistance to malaria 06/02/17 26 Mrs Smith: Ch 11 Monohybrid Cross. 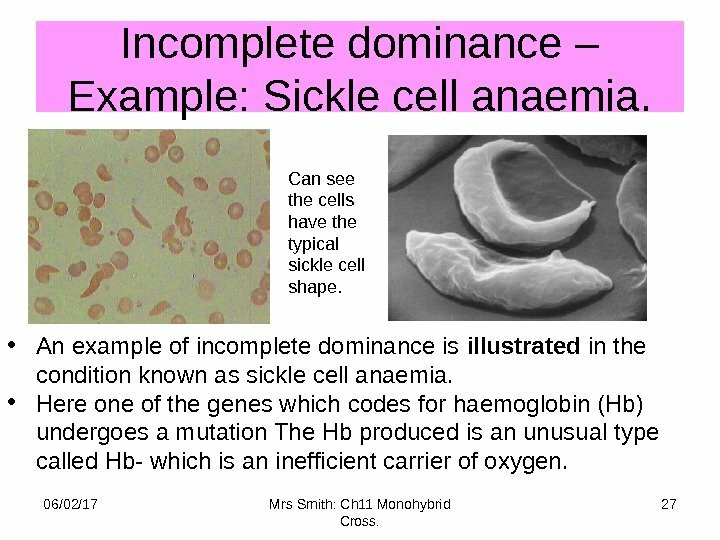 Incomplete dominance – Example: Sickle cell anaemia. 06/02/17 27 Mrs Smith: Ch 11 Monohybrid Cross. 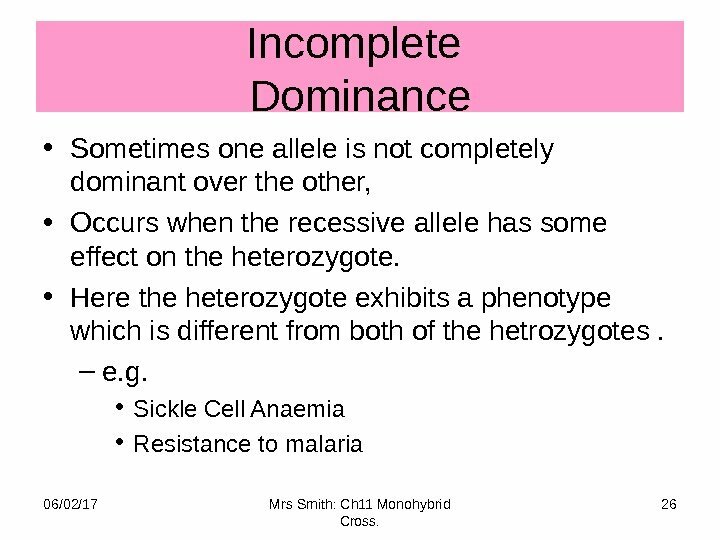 • An example of incomplete dominance is illustrated in the condition known as sickle cell anaemia. • Here one of the genes which codes for haemoglobin (Hb) undergoes a mutation The Hb produced is an unusual type called Hb- which is an inefficient carrier of oxygen. Can see the cells have the typical sickle cell shape. 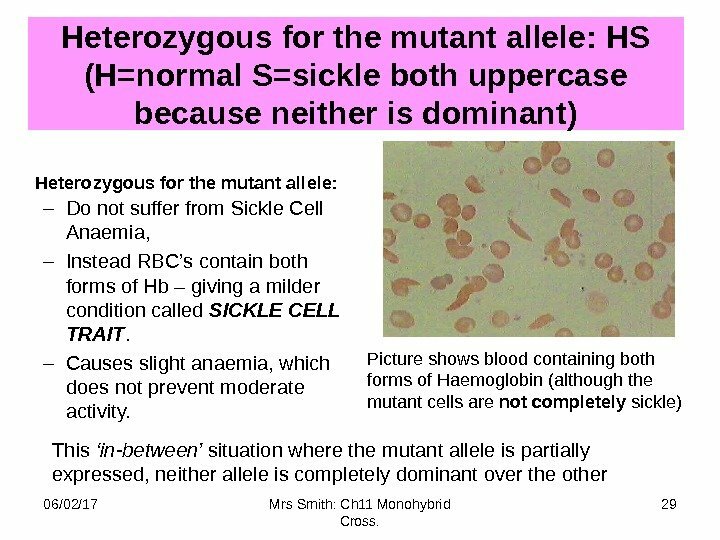 Homozygous for the mutant allele: SS Homozygous for the mutant allele: SS • Disastrous consequences, sufferers SICKLE CELLED ANAEMIA , they have the abnormally shaped sickle cell blood, RBC’s fail to perform function well. • Causes shortage of oxygen, damage of internal organs and in many cases death. 06/02/17 Mrs Smith: Ch 11 Monohybrid Cross. 28 Picture shows blood containing only Haemoglobin wit the Sickle shape. 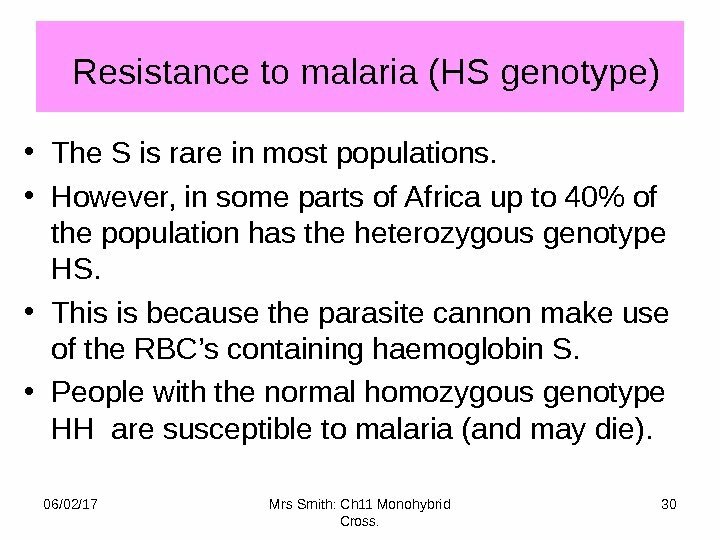 Resistance to malaria (HS genotype) • The S is rare in most populations. • However, in some parts of Africa up to 40% of the population has the heterozygous genotype HS. • This is because the parasite cannon make use of the RBC’s containing haemoglobin S. • People with the normal homozygous genotype HH are susceptible to malaria (and may die). 06/02/17 Mrs Smith: Ch 11 Monohybrid Cross. 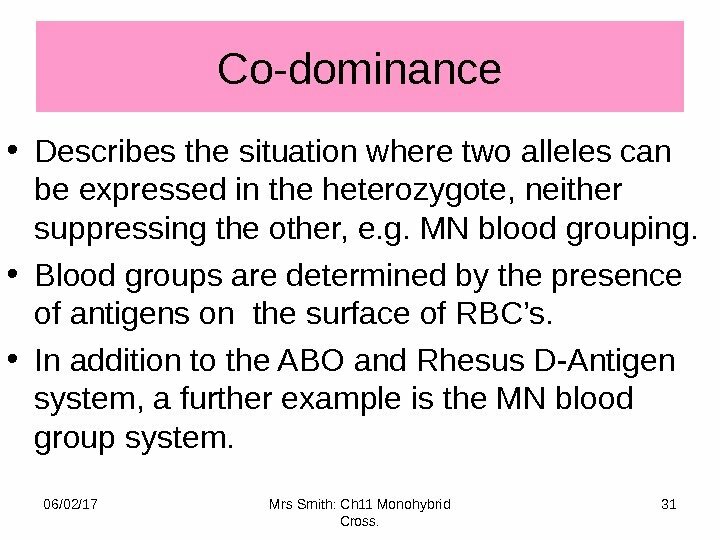 Co-dominance • Describes the situation where two alleles can be expressed in the heterozygote, neither suppressing the other, e. g. MN blood grouping. • Blood groups are determined by the presence of antigens on the surface of RBC’s. • In addition to the ABO and Rhesus D-Antigen system, a further example is the MN blood group system. 06/02/17 31 Mrs Smith: Ch 11 Monohybrid Cross. MN Blood Group • Controlled by two alleles M and N which are co-dominant (both alleles expressed in the phenotype of the heterozygote). 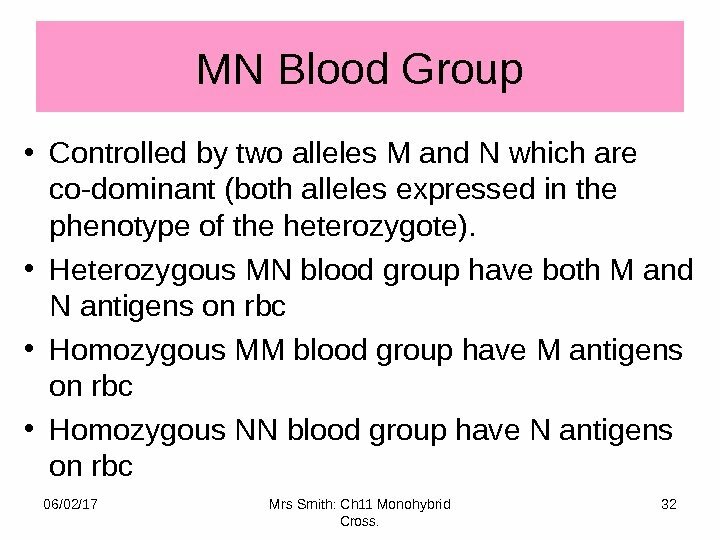 • Heterozygous MN blood group have both M and N antigens on rbc • Homozygous MM blood group have M antigens on rbc • Homozygous NN blood group have N antigens on rbc 06/02/17 32 Mrs Smith: Ch 11 Monohybrid Cross. Multiple Alleles • Each of the genes considered so far has two alleles ( which display complete, incomplete or co-dominance). • Some genes are found to possess 3 or more different alleles for a certain characteristic. . It has multiple alleles. 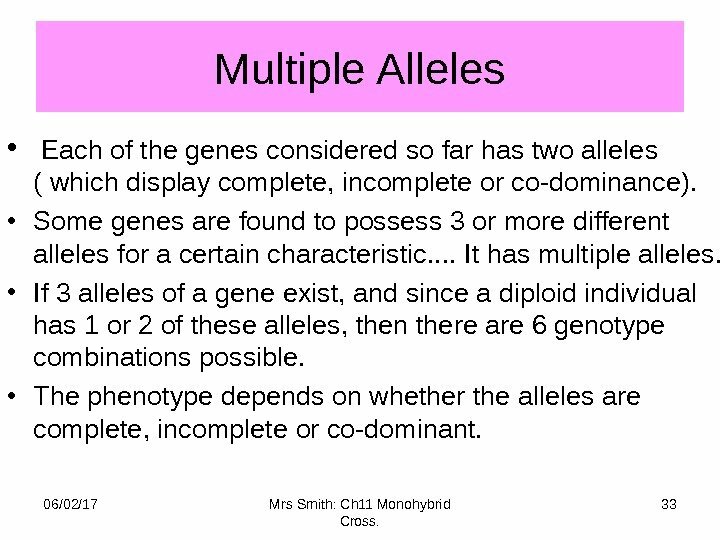 • If 3 alleles of a gene exist, and since a diploid individual has 1 or 2 of these alleles, then there are 6 genotype combinations possible. 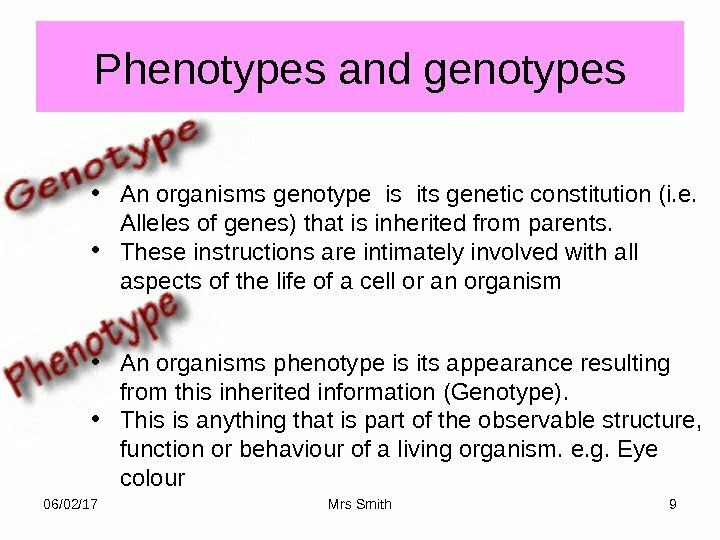 • The phenotype depends on whether the alleles are complete, incomplete or co-dominant. 06/02/17 Mrs Smith: Ch 11 Monohybrid Cross. 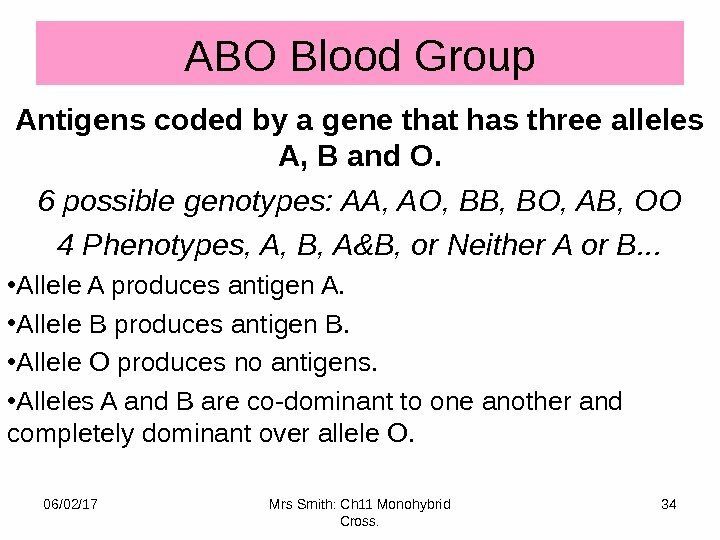 ABO Blood Group Antigens coded by a gene that has three alleles A, B and O. 6 possible genotypes: AA, AO, BB, BO, AB, OO 4 Phenotypes, A, B, A&B, or Neither A or B. . . • Allele A produces antigen A. • Allele B produces antigen B. • Allele O produces no antigens. 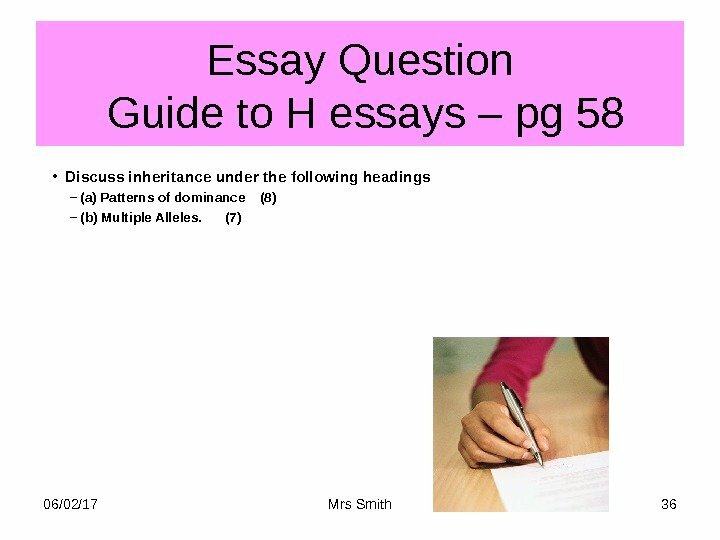 • Alleles A and B are co-dominant to one another and completely dominant over allele O. 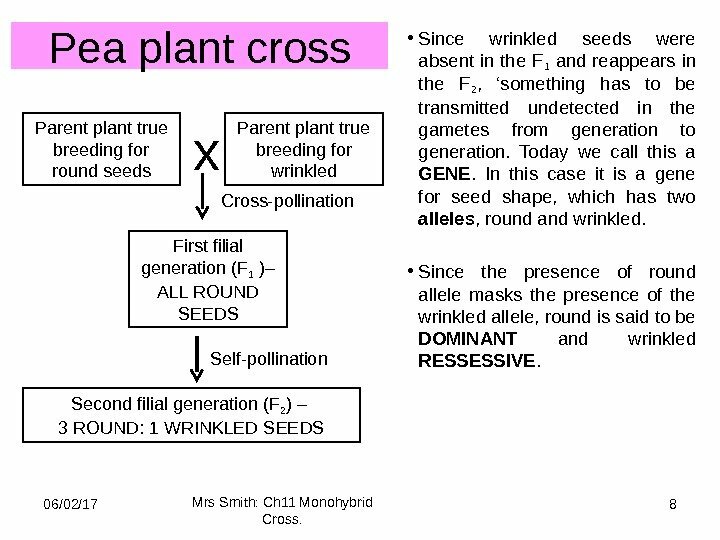 06/02/17 34 Mrs Smith: Ch 11 Monohybrid Cross.